After mentioning it in last week’s post, it only seems right to give the bottle that re-introduced me to bourbon a post of it’s own. A couple of years ago we were on holiday with a friend who had spent some time in the States and on noticing this in the local supermarket, he excitedly bought a bottle for us to enjoy that evening. Perhaps the best way to describe our reaction is to admit that the next day, we emptied that supermarket and when they restocked, we emptied it again. I came home with three bottles, and I’ve had to refresh my supply since. It’s that nice. 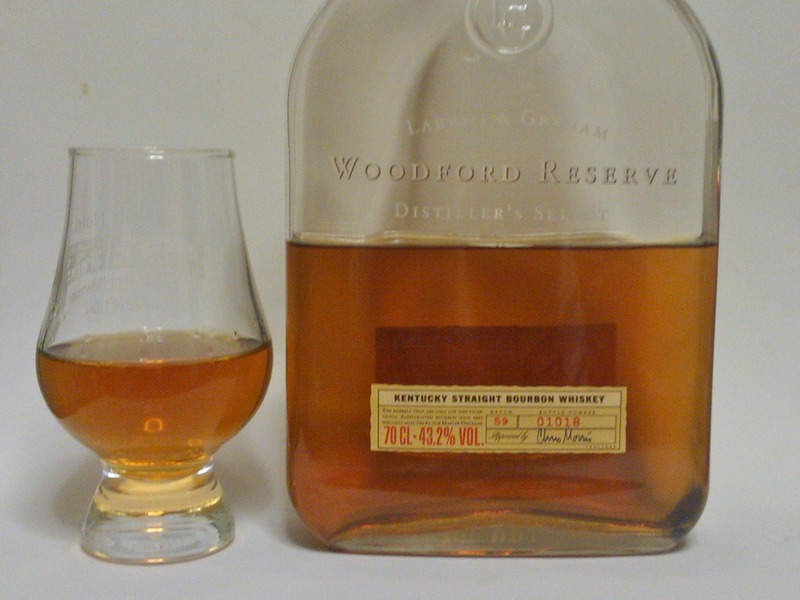 This is Woodford Reserve Distiller’s Select, their entry level offering (and often on special offer in your friendly local supermarket, it seems!). It’s a fairly gentle 43.2% ABV, and comes in a very pleasingly shaped, flat rectangular bottle. The first thing that strikes you on the nose is the sweetness; there’s a real hit of rich, sweet toffee balanced out perfectly with the alcohol. There’s also plenty of vanilla and a nod to the wood of the barrel. Water, to be honest, doesn’t have a huge impact other than to soften up those sweet notes a little. In the mouth, the sweetness is right there on the tip of your tongue. The warming alcohol quickly fills your mouth, slowly fading to let the rye push through with rich, almost rum-like tones dancing all the way through. The finish is a long, lingering warmth with plenty of alcohol dryness to it as well. As with the nose, a splash of water doesn’t drastically change the taste – the alcohol is less in your face but it remains deliciously sweet and smooth. This isn’t the most complex whisky you’ll ever encounter; but it’s a perfect drinking whisky – smooth, sweet, surprisingly alcoholic given the relatively low ABV and if you’ve not dabbled in bourbon you could do a lot worse than start here.